A few images below before the crowds arrived. There is work by my partner Chris Donnelly, Clare Andrews, Sally-Ann Provan, Hatti Pattison and Lyndsey Jean Henderson also in these shots; just a few of the other lovely Beaverhall residents! The first new finished pieces were sent to Contemporary Applied Arts for their Christmas show; image below. Work over the last year has explored natural history collections, with different series of specific forms such as plate the focus. This new series focuses on collections viewed in UK based museums. The lidded jar or container is associated with collecting and containing historic specimens. 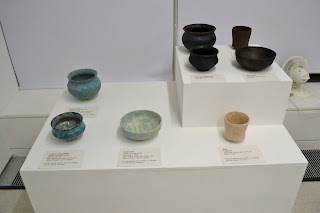 It is sometimes directly connected with the animal (18th/19th century tobacco jars made from rhino feet for example), and so was chosen for this project (as yet untitled). Like the animal specimens themselves, the jars are hollow and function to ‘contain’ and permanently fix the images of the animals, frozen into their poses. The jars are intended in a sense to commemorate the animals and reflect their characteristics. Drawings were made of various specimens, which were then made into transfers layered over painted and printed surfaces. Selected photographs have been used, although the focus with this work is on the drawn image. Abstracted backgrounds refer loosely to the museum setting. They are handbuilt and individual, although part of a larger ongoing series which will develop over the next few months. And finally here is a image of some work made by product design post-grad student Jaume Miro at the studio; he is developing experimental glazes using reclaimed and recycled computer parts. I’ve built the vessels to his requirements based on traditional African pots (the black ones), and he has created glazes from scratch using the extracted raw materials…deceptively simple, but a lot of work to get to this stage and some exciting results so far! its been a really interesting process to work with someone else to help them develop their ideas and practical outcomes. Useful I think as an artist, when you are used to working on personal or specific concepts and themes, to step outside of this and create things to someone else’s specifications. To date it has been a rewarding process to work with others at the studio and get differing perspectives on ceramics.